JiveWorld16 Developer Conference ... It's a Wrap! JiveWorld16 Developer Tri-Hackathon Registration (FREE) is Now Open! and while we are glad we tried a lot of new things this year, we are excited to start working on next year's conference and agenda to make it even better! We wanted to take a moment to share some of these quick updates, so developers could start watching the videos and trying all the new goodies revealed at the conference! Catch up on sessions you missed and/or re-live the sessions to pick up that extra detail. These videos with slides are available to make sure that no detail is missed and you walk away fully informed about the latest developer platform enhancements! Reach out in the Developer community or in the comments section of the respective videos if you have any follow-up questions. We are here to help! Technologies are ever-changing, and so are platforms. With the release of Jive 8 and the latest version of Jive Cloud, Jive has added simpler and more powerful ways to build integrations that harness the social context that drives your business. In this session, you will get an overview of Jive’s integration architecture, new techniques for constructing business applications, and proven strategies to help developers maximize time while expediting return on investment. Coupled with an unparalleled user experience and off the charts user engagement, it is easy to see why more and more customers are turning to Jive as their go-to enterprise development platform. Formerly known as Project Iris, Jive iPaaS has been built to streamline developer solutions from conception, to testing and on through deployment. With a creation wizard, project templates, service management and rapid testing options, developing Jive add-ons with middleware has never been easier. In this session, you will hear Jive Product Management discuss the capabilities of the Jive iPaaS SDK and and how you can start building your solutions on it today. When it comes to building the best enterprise solutions, creating things your way is hard to beat. With the emergence of the add-on framework, Jive has opened the doors for developers to build solutions in their preferred languages. In this session, Jive experts will share experiences building add-on solutions in Java and Ruby from the ground up. Learn strategies and best practices on how to build a Jive add-ons using your preferred web-ready programming language and get ready to build something awesome. Be sure to check out our open source jive-sdk-* repos on github.com/jivesoftware and get started today! Building amazing user experiences is the cornerstone for any successful social system integration. In this interactive session, Jive engineers will navigate the latest improvements to the App, Add-On and Tile frameworks, in both Jive 8 and Cloud, that enable developers to integrate solutions into Jive’s amazing user-experience. As we look to the future of the Jive platform, it is hard to not recognize emerging technologies that will have a foreseeable impact on how developers integrate with Jive. Two such technologies are microservices architecture and iPaaS (Internet Platform as a Service). In this session, you will hear from Gal Oppenheimer at Built.io, share his views about growing microservice & iPaaS trends and what it means for the future of building scalable Jive integrations in the cloud. Socializing third-party system activity in Jive is a powerful integration pattern, especially if you can enrich the activity from all the right systems. In this session, Jive’s Developer Evangelist will walk you through the progressive power behind Jive’s Simple Stream Integrations. Learn strategies and best practices on how to effectively scale this powerful, yet simple capability in your enterprise without middleware. A quick overview on Docker containers, usages, and how to scale up from a single container to a fleet of containers working together with Kubernetes for real-life workloads, such as running java-based applications! Join this session to see how to use Kubernetes to launch, manage, and rolling-upgrade a fleet of Java application instances with session replication. Kubernetes builds on top of Docker to construct a clustered container scheduling service. Kubernetes enables users to ask a cluster to run a set of containers. The system will automatically pick worker nodes to run those containers on, which we think of more as “scheduling” than “orchestration”. Kubernetes also provides ways for containers to find and communicate with each other and ways to manage both tightly coupled and loosely coupled sets of cooperating containers. In this session, you’ll learn: – How to containerize different Java-based microservice workloads using Docker and different build tool plugins – Deploying and managing a fleet of Java-based microservices in Kubernetes – Service discovery 101 in Kubernetes – Perform critical DevOps steps, such as canary, rolling update, roll backs… – Tips and tricks! The Jive platform has a lot to offer developers. Everything from add-ons, to apps, stream integrations, to webhooks and even data services for analytics are at the developers disposal to build feature rich enterprise solutions. In this session, Pawan will demonstrate how ThoughtWorks utilizes the Jive add-on framework and Jive’s open source Node.js SDK to add new features and capabilities to Jive Cloud. If you are looking to uncap the true power of the Jive platform using the add-on framework, this is a session you do not want to miss! Bigger isn’t always better. In fact, sometimes the most valuable solutions you can build are the simplest and easiest to roll-out. With the latest improvements to the Jive platform, it has never been easier to develop and deploy quick solutions that add real value to the business. In this session, you will learn tips, tricks and best practices from Jive experts on how to build fast and effective solutions on the Jive platform. If you are interested in learning about low-friction quick wins with Jive development, then this session is for you! This session was very informal, but very interactive. We had Jive engineering/product executives and architects in attendance to answer questions directly from the audience. Lots of features were suggested and many have been already been noted for internal consideration. Overall, the session was very well received and we plan to do it again next year! The inaugural launch of our new hackathon format was a glowing success. All those who participated loved the breakout of the hackathon experience; however, we had some work to do to polish some of the edges. This was to be expected, but we are glad that those who could attend enjoyed their experience and learned some new things in Jive along the way. Below are the winners from each stage of the Tri-Hackathon. Check out the Developer Coding challenges to see how you would do! including the best in show award! When it comes to arcade games, do not mess with this guy. He scored a scorching 72,650 on GunSmoke to claim the prize! A true tri-hackathon dark horse. He came out of nowhere and scored a conference high 34k points to win the Hacker Trivia Challenge! "Andrey the Rockstar" created created a expansive logic flow with multiple activity integrations into Jive with Built.io's Flow. In between rounds of dominating the arcade, Patrick put together some awesome Flow integrations! Wow, stop being so incredibly good at everything! Andrey showed incredible mastery with a Jive Inbox Pebble WatchApp that he put together in almost no time at all using Pebble Cloud IDE. Congrats on creating such a thorough app! Be sure to check out more of our updates on @jivedev on Twitter. The introduction is going to have me looking at what I can do with Built.io, I don't think there is any better correlation with their objectives than that. We had a long list of challenges to get through, I haven't even read through the whole list, but I was about to comment to the effect of "next year it would be great to see iPaaS, Docker Containers, Google Cloud etc (didn't see Kubernetes). Well guess what, we had those challenges, and now post event we can complete them at any time. It's really kind a free dev training course if you think about it. Now not only do you have a Jive focus, but a DevOps focus. Perhaps times are changing, but when I first started in development, getting your hands on this kind of stuff was impossible if it even existed at all. This marks the end of the Tri-Hackathon. An exciting conclusion to an equally exciting setup. I didn't cut the mustard on our three challenges unfortunately, but it was a nice close race for those at the top of the board and I know we all had fun. I'm also excited to see the new direction and forms the hackathon takes in the future. There is some talk of taking it on the road to meet the developers, perhaps as part of local meet ups. If they could work out the format just right I think that would be amazing. A great combination of the challenges. Be it Jive itself or Built.io, there were plenty of things to hack and plenty of experts in the house before. I believe I said it during the first day post, but it really made an excellent bookend to the talks and live sessions where they would go through the demos themselves, giving plenty of your own context into the fast moving tech (hey, they only had an hour in most cases). Also interesting to see will be how they prevent the bit of gaming the system we say with the trivia challenge. Funny to see, though I still think there should have been a dishonorable mention. Great fun everyone! Congrats to our winners and I hope to see you all at the challenge next year should I be able to make it. Day 2 is in the books, and with it a couple of completed hacking challenges. I needed a bit more help from the Jive team, even on these easy ones. A few great lessons in debugging for sure. I actually really liked the multi-day aspect of this over a single long stretching event. It gave me some time to think over which challenges to take, and extend what I was hearing during the technical speaking sessions. If anything, there might be a few too many coding challenges, you feel compelled to complete them all or none at all, but I understand that it speaks to the myriad of ways we can actually approach development in the environment: in turn it makes it all that much more important to have a technical expert on your side, because there are a million ways to skin a cat. My approach has been to focus on the easier challenges to get the badge early, but with it now obtained I'm going to change over to the harder for the final day. I'm wondering if I'll even be able to wrap up one given the amount of slogging that this day included. Day 1 of the JiveWorld Tri-Hackathon is cleared. Once again, the Jive team has evolved the formula around how they conduct it, and I found myself learning a lot. For comparison I'll use 2 things: some thoughts from my own organization on hackathon activities, and the 2013 JiveWorld event. With this short, 5 hour event, the team did something interesting by introducing a couple of other distractions to the activity: a technology quiz and a video game cabinet. Sure, I think the timer on the quiz made most of the answers a guess, and the sticks on the game machine are a bit hit or miss (I'm a vintage game connoisseur after all), but it seemed to me more in alignment with having a bit of fun, versus a focused self driven training walk through. This was a contrast to what I observed during the 2013 event. There we had some cool gadgets to play around with, but it seemed to devolve quickly into a genius bar kind of experience, where developers were bringing up their own tasks for some free advice and troubleshooting. It didn't have the same kind of energy or direction that this one now had. Bottom line, great event so far. Perhaps it's better that they didn't go Galaga for the cabinet game. It would have been very discouraging for everyone else. I'll be there tomorrow as well to continue my experience... and check on my score. See you there! 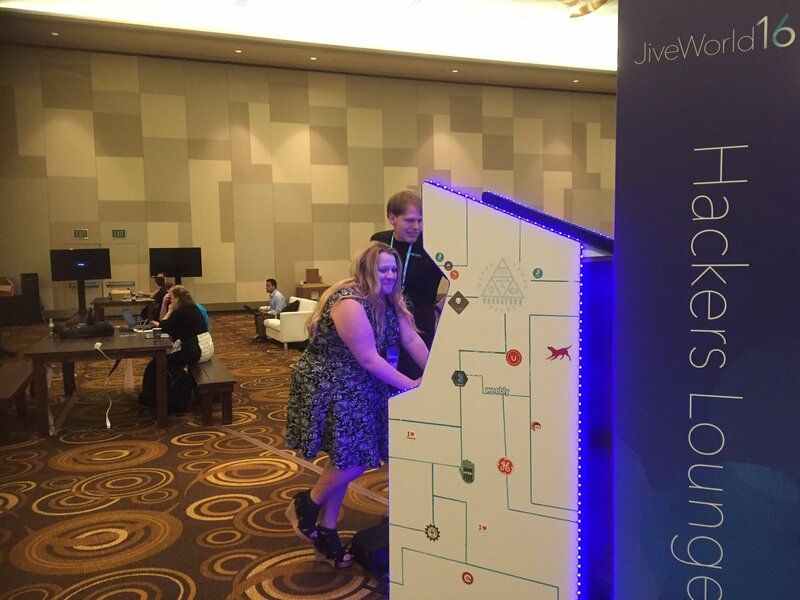 Win Great Prizes at the JiveWorld16 Tri-Hackathon! Ok, so this year's JiveWorld Developer Conference is really going to be like nothing you've experienced before! We've got an amazing theme this year that Ryan Rutan posted up some details in Announcing a Tri-Hackathon at JiveWorld16 Developer Conference w/Limited Edition T-Shirt. Since it's literally right around the corner, I wanted to tease some of the great prizes you can win this year from Jive and this year's hackathon sponsors—as well as some things that can really get you a head start! You can win up to $200 in gift cards from Jive for finishing challenges, developing something awesome, playing some video games, and testing your knowledge of some hacker trivia! Complete the Sponsored Challenges from Built.io and win an Amazon Echo or other great prizes! Build a Pebble WatchApp or WatchFace that integrates Pebble and Jive to win a Pebble Time Steel (multiple colors to choose from)! As we prepare to launch into JiveWorld16, we wanted to do all we could to make sure that developers understood the power that exists at their finger tips with the Jive developer platform! What is my app context? Where is my app being viewed? How is my app being displayed? How to target app delivery to only key points in the Jive UX? [Enter, Stage Left] Jive Developer App Reference "App"
Implements every action contribution in the App Action Contribution Reference, including distinct actions for "All Places", "All Content" and their individual content/place type specifics. Who is the current viewer? What is my current view name & context? What is my current action name & context? Get/Setting View Params for in-app linking. We've updated the Getting Started > Creating an App with the Jive Node SDK tutorial with details on how you can generate this app for yourself to get started on your own. As always, I hope this helps ... and enjoy! So what did I build here and why? How can my organization use this? So for the past several years, I've tested and/or owned almost every type of smartwatch there is on the market—from the Nike Fuel Band, Fitbits', Garmins', Apple Watch, Samsung Gears', Microsoft Bands'—and none of them have captured by heart and wrist like the Pebble watches have. Where most watches are too complicated, uncomfortable, and unattractive, the Pebble has nailed it since Day 1 with the Pebble Classic. Now, I'll admit that I'm an uber techie who loves having the latest toys, the smartwatch has never been my thing. At this moment I'm wearing a watch from 1987; what I wear most days. So it's really a testament that I'm advocating and promoting a smartwatch—especially the Pebble Time Round . I'm not the only one that's saying it, check out Gizmodo's article on their take on The Best Smartwatch For Every Wrist. Well, Jive provides Jive REST API v3.14 → Action entity to be sent to a user that they can respond to and take "action" on. There are somewhere around 40 verbs that Jive has for the /actions endpoint, and one of them is "http://activitystrea.ms/schema/1.0/post" created by this: Jive REST API v3.14 → Activity Creation #Sending Actions. The smart watch is the perfect low commitment method to increase awareness and engagement from your community's users. In today's workplace and in the future, I see smartwatches more commonplace and Pebble's no muss, no fuss, clear as day UI is a great tool for enterprise. Also, if you're always building enterprise software, it's kind of fun to do something different . From a workflow and security perspective, if a user requests access to a private group, the group admin can either approve or reject that request right from their wrist without ever needing to pull out their phone or laptop. For HR, company RSVP's to events to get a proper headcount is fast and easy. /appinfo.json Meta properties for app. Also includes resource identifiers for images and our config appKey enums. All params can be set in your Cloud Pebble's project settings. /src/app.js Our main execution script. Pebble by default looks for and runs this file on launch. /src/captionImages.js Really a JSON file that assigns Jive Action caption values to images and buttons. /src/config.js Configuration for Clay. We create the form fields and assign the corresponding appKey (set in the appinfo.json) for storage on the watch. A JSON file. The repo contains most of the comments inline, so this an overview explanation with links to documentation. This is written entirely in Pebble.js though it can be done in a C and JS combo but for ease of understanding, we're using Pebble.js only and going to refer you to the Cloud Pebble IDE . Since the JIve /actions/ endpoint is dependent on the user, we only need Basic Auth. Pebble typically requires an externally hosted page for configuration of an app, however we used a new API just released called pebble/clay: Pebble Config Framework for an offline config. This lets us avoid having to set up a new service to then store the credentials into the watch. The user is originally displayed a pre-defined Window of type Card. That gives feedback to the user of the Pebble app requesting the endpoint from Jive. On anything but success the body field of the Card object is replaced with a error dialog. On success the data is then sorted for Jive Action verbs that we wish to display and filter out those that we don't. The array contains the title and subtitle we want to display in each menu item of the Menu object. The sorted array of action items are displayed in a Menu window. The Menu window has specific properties that handles button presses, the UP and DOWN buttons for scrolling and the SELECT button to select the item. When a Menu Item is selected, the "menu.on" handler's callback displays a new Card object that has the related information we want to show the user, and the icons that corresponds to our pre-defined list of captions for window's actionDef property. Since the Pebble only has 3 buttons, you should not create actions with more than 3 options. With the iconography displayed, when a user clicks an associated button, the sendAction() function is called and we make a POST request to the /actions/<action id>/actions/<captions> endpoint with the caption associated with the button. On success or error we display a UI card to notify the user. Success retrieves an updated actions array from Jive. Pay attention to the cards in memory and removing the associated cards. When the user clicks the BACK button, he/she will be taken to the Window layer just before the current layer. Stay tuned for a special post about JiveWorld16 and Pebble!